Acute glomerulonephritis following streptococcal infection is characterized by the sudden appearance of hematuria, proteinuria, red blood cell casts in the urine, edema, and hypertension with or without oliguria. [1, 2] (See the image below.) Poststreptococcal glomerulonephritis was first recognized as a complication of the convalescence period of scarlet fever in the 18th century. A link between hemolytic streptococci and acute glomerulonephritis was recognized in the 20th century. 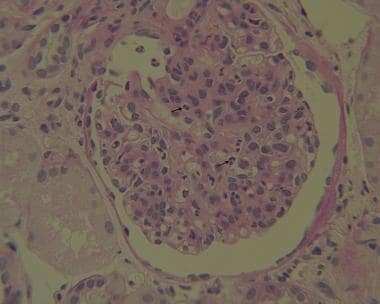 Kidney biopsy from a 7-year-old child with acute poststreptococcal glomerulonephritis. Periodic acid–Schiff stain (at 40x) shows the intracapillary and occasional mesangial neutrophil (arrows). Courtesy of Laura Kidd, MD, Pathology and Laboratory Medicine, Tulane University Medical School. The workup in patients with suspected acute poststreptococcal glomerulonephritis includes tests to provide evidence of preceding streptococcal infection, renal function studies, and serologic studies (see Workup). The major goal of treatment is to control edema and blood pressure (see Treatment and Medication). See also Acute Poststreptococcal Glomerulonephritis, Acute Glomerulonephritis, and Emergent Management of Acute Glomerulonephritis. Poststreptococcal glomerulonephritis follows infection with only certain strains of streptococci, designated as nephritogenic. The offending organisms are virtually always group A streptococci. Acute poststreptococcal glomerulonephritis (APSGN) follows pyodermatitis with group A streptococci M protein types 47, 49, 55, 2, 60, and 57 and throat infection with streptococci M types 1, 2, 4, 3, 25, 49, and 12. Many morphologic, clinical, and serologic features suggest that APSGN is an immune complex disorder in which an immune complex containing a streptococcal antigen is deposited in the affected glomeruli. The size of glomerular basement membrane (GBM) pores and the molecular size of the streptococcus-Ig complex are also important determinants. The molecular size of the streptococcus-Ig complex is about 15 nm (10 nm for streptococcus group A and 5 nm for immunoglobulin). The GBM pore sizes in children and adults are 2-3 nm and 4-4.5 nm, respectively. Therefore, the immune complex molecule can be more easily rodded into the glomerulus in children than in adults and, thus, may explain the higher frequency of APSGN in children than in adults. Two antigens isolated from nephritogenic streptococci are commonly implicated in APSGN: streptococcal pyrogenic exotoxin B (SPEB) and nephritis-associated plasmin receptor (NAPlr). [7, 8] Both SPEB and NAPlr bind plasmin, protecting it from physiological inhibitors, and thus could cause chemotaxis of inflammatory cells and degradation of glomerular basement membranes. Both can be found in the glomeruli of APSGN tissues  . In addition to streptococcal antigens, rheumatoid factor, cryoglobulins, and antineutrophil cytoplasmic serum antibodies are present in some of these patients. The pathogenic significance of this autoimmune response is not defined. APSGN can occur sporadically or epidemically. The incidence seems to be decreasing in the United States and Europe, but sporadic cases of the disease continue to be reported from all over the world. The prevalence of nephritis varies considerably among persons with sporadic infections with nephritogenic streptococci. The reason for this variability is not known. Early death is extremely rare in children (< 1%) but is significantly more common in adults (25%). This is secondary to congestive heart failure and azotemia. Congestive heart failure is more common in adults (43%) than in children (< 5%). Nephrotic-range proteinuria is also more common in adults (20%) than in children (4-10%). Approximately 83% of adults have azotemia, compared with 25-40% of children. No racial predilection is recognized. Clinical cases of APSGN are twice as common in males than in females. If subclinical disease is considered, both sexes are affected equally. The familial incidence rate is nearly 40%, but no genetic marker has been identified. This condition typically affects children aged 2-12 years. A large series reported that 5% are younger than 2 years and 10% are older than 40 years. Balasubramanian R, Marks SD. Post-infectious glomerulonephritis. Paediatr Int Child Health. 2017 Sep 11. 1-8. [Medline]. Maness DL, Martin M, Mitchell G. Poststreptococcal Illness: Recognition and Management. Am Fam Physician. 2018 Apr 15. 97 (8):517-522. [Medline]. Zegers RH, Weigl A, Steptoe A. The death of Wolfgang Amadeus Mozart: an epidemiologic perspective. Ann Intern Med. 2009 Aug 18. 151(4):274-8, W96-7. [Medline]. Rodriguez-Iturbe B, Musser JM. The current state of poststreptococcal glomerulonephritis. J Am Soc Nephrol. 2008 Oct. 19(10):1855-64. [Medline]. Ahn SY, Ingulli E. Acute poststreptococcal glomerulonephritis: an update. Curr Opin Pediatr. 2008 Apr. 20(2):157-62. [Medline]. Stamatiades EG, Tremblay ME, Bohm M, Crozet L, Bisht K, Kao D, et al. Immune Monitoring of Trans-endothelial Transport by Kidney-Resident Macrophages. Cell. 2016 Aug 11. 166 (4):991-1003. [Medline]. Batsford SR, Mezzano S, Mihatsch M, et al. Is the nephritogenic antigen in post-streptococcal glomerulonephritis pyrogenic exotoxin B (SPE B) or GAPDH?. Kidney Int. 2005 Sep. 68(3):1120-9. [Medline]. Oda T, Yoshizawa N, Yamakami K, Sakurai Y, Takechi H, Yamamoto K, et al. The role of nephritis-associated plasmin receptor (NAPlr) in glomerulonephritis associated with streptococcal infection. J Biomed Biotechnol. 2012. 2012:417675. [Medline]. [Full Text]. Bakr A, Mahmoud LA, Al-Chenawi F, et al. HLA-DRB1* alleles in Egyptian children with post-streptococcal acute glomerulonephritis. Pediatr Nephrol. 2007 Mar. 22(3):376-9. [Medline]. Ilyas M, Tolaymat A. Changing epidemiology of acute post-streptococcal glomerulonephritis in Northeast Florida: a comparative study. Pediatr Nephrol. 2008 Jul. 23(7):1101-6. [Medline]. Jackson SJ, Steer AC, Campbell H. Systematic Review: Estimation of global burden of non-suppurative sequelae of upper respiratory tract infection: rheumatic fever and post-streptococcal glomerulonephritis. Trop Med Int Health. 2011 Jan. 16(1):2-11. [Medline]. Hoy WE, White AV, Dowling A, Sharma SK, Bloomfield H, Tipiloura BT, et al. Post-streptococcal glomerulonephritis is a strong risk factor for chronic kidney disease in later life. Kidney International. May 2012. 81(10):1026-32. [Medline]. VanDeVoorde RG 3rd. Acute poststreptococcal glomerulonephritis: the most common acute glomerulonephritis. Pediatr Rev. 2015 Jan. 36 (1):3-12; quiz 13. [Medline]. Kakajiwala A, Bhatti T, Kaplan BS, Ruebner RL, Copelovitch L. Post-streptococcal glomerulonephritis associated with atypical hemolytic uremic syndrome: to treat or not to treat with eculizumab?. Clin Kidney J. 2016 Feb. 9 (1):90-6. [Medline]. Mara-Koosham G, Stoltze K, Aday J, Rendon P. Pulmonary Renal Syndrome After Streptococcal Pharyngitis: A Case Report. J Investig Med High Impact Case Rep. 2016 Apr-Jun. 4 (2):2324709616646127. [Medline]. [Full Text]. Adikari M, Priyangika D, Marasingha I, Thamotheram S, Premawansa G. Post-streptococcal glomerulonephritis leading to posterior reversible encephalopathy syndrome: a case report. BMC Res Notes. 2014 Sep 13. 7:644. [Medline]. [Full Text]. Zaki SA, Shanbag P. Unusual presentation of poststreptococcal glomerulonephritis as posterior reversible encephalopathy syndrome. J Pediatr Neurosci. 2014 Jan. 9 (1):42-4. [Medline]. Ayoob RM, Schwaderer AL. Acute Kidney Injury and Atypical Features during Pediatric Poststreptococcal Glomerulonephritis. Int J Nephrol. 2016. 2016:5163065. [Medline]. [Full Text]. Parra G, Rodriguez-Iturbe B, Batsford S, et al. Antibody to streptococcal zymogen in the serum of patients with acute glomerulonephritis: a multicentric study. Kidney Int. 1998 Aug. 54(2):509-17. [Medline]. Glassock RJ, Alvarado A, Prosek J, Hebert C, Parikh S, Satoskar A, et al. Staphylococcus-related glomerulonephritis and poststreptococcal glomerulonephritis: why defining "post" is important in understanding and treating infection-related glomerulonephritis. Am J Kidney Dis. 2015 Jun. 65 (6):826-32. [Medline]. Nadasdy T, Hebert LA. Infection-related glomerulonephritis: understanding mechanisms. Semin Nephrol. 2011 Jul. 31 (4):369-75. [Medline]. Taskesen M, Taskesen T, Katar S, et al. Elevated plasma levels of N-terminal pro-brain natriuretic peptide in children with acute poststreptococcal glomerulonephritis. Tohoku J Exp Med. 2009 Apr. 217(4):295-8. [Medline]. [Full Text]. Wu SH, Liao PY, Yin PL, Zhang YM, Dong L. Elevated expressions of 15-lipoxygenase and lipoxin A4 in children with acute poststreptococcal glomerulonephritis. Am J Pathol. 2009 Jan. 174(1):115-22. [Medline]. [Full Text]. Sorger K, Gessler U, Hubner FK, et al. Subtypes of acute postinfectious glomerulonephritis. Synopsis of clinical and pathological features. Clin Nephrol. 1982 Mar. 17(3):114-28. [Medline]. Kidney biopsy from a 7-year-old child with acute poststreptococcal glomerulonephritis. Electron microscopy image shows rare large subepithelial deposits, or “humps” (arrows). Courtesy of Laura Kidd, MD, Pathology and Laboratory Medicine, Tulane University Medical School. Kidney biopsy from a 7-year-old child with acute poststreptococcal glomerulonephritis. Immunofluorescence (C3) shows a granular capillary and mesangial staining pattern with segmental areas of “lumpy-bumpy” staining (white arrows). Courtesy of Laura Kidd, MD, Pathology and Laboratory Medicine, Tulane University Medical School. Disclosure: Received honoraria from Genentech for educational training of sales force for: Consultant to ChemoCentryx and Consultant to Kyowa Hakko Kirin.